Rabbi Abraham Isaac Kook (1865-1935), the celebrated first Chief Rabbi of pre-state Israel, is recognized as being among the most important Jewish thinkers of all times. His writings reflect the mystic’s search for underlying unity in all aspects of life and the world, and his unique personality similarly united a rare combination of talents and gifts. Rav Kook was a prominent rabbinical authority and active public leader, but at the same time, a deeply religious mystic. He was both Talmudic scholar and poet, original thinker and saintly tzaddik. --Can we reconcile the Torah’s account of creation with modern science? --What is the Torah’s view on vegetarianism? --What is the purpose of death? --Why do bad things happen to good people? --Why do we have dreams? --Will the Third Temple have animal sacrifices? --How can one attain joy in serving God? --How should we balance our time between Torah study and work? -Why must kohanim avoid cemeteries? “Gold from the Land of Israel is a wonderful introduction to the profound teachings of HaRav Avraham Yitzchak haKohen Kook zt”l. In these succinct and clearly-written essays, Rabbi Morrison has succeeded in expounding on major themes from Rav Kook’s thought. Those who are not familiar with the Rav’s teachings will be exposed to the profound ideas and remarkable scope of his writings. Rav Kook zt”l was one of the outstanding scholars of his time, and his teachings and writings are the cornerstone of Jewish life in Israel today. By entering the realm of Torah as presented by Rav Kook, one strengthens his bonds to Eretz Yisrael. Gold from the Land of Israel is an outstanding and urgently needed contribution to the otherwise restricted world of the study of Rav Kook's complex writings. -Rabbi Ari Enkin, author of "Dalet Amot - Halachic Perspectives"
This book is an extremely useful tool to enable the reader to enter Rav Kook's texts. In this world of an ever-endangered Israel, it behooves the reader to avail him/herself and absorb the messages of Rabbi Avraham Yitzchak Kook's treasured writings about the eternal value of the Holy Land and the Jews destined to rule over her. The Torah claims that they cried out "Zeh Keli V'anve'Hu" - "This is my God and I will glorify Him." According to the Midrash, they were then able to comprehend reality in a manner beyond normal prophecy. Rav Kook explains that they witnessed Divine intervention in an immediate way. Prophets, however, must first uncover the veil of natural law and causality before yelling to the world about some wonderful phenomenon. Rabbi Abraham Isaac Kook (1865-1935), the celebrated first Chief Rabbi of pre-state Israsel, is recognized as being among the most important Jewish thinkers of all times. His writings reflect the mystic’s search for underlying unity in all aspects of life and the world, and his unique personality similarly united a rare combination of talents and gifts. Rav Kook was a prominent rabbinical authority and active public leader, but at the same time, a deeply religious mystic, teacher, writer, Talmudic scholar, poet, original thinker and saintly tzaddik. Rabbi Chanan Morriston, a former student at Mercaz HaRav, is deeply immersed in the writings and thought of Rav Kook and has done a masterful job of extracting Rav Kook’s thoughts on the weekly Parashah. This is a book to return to again and again. Rabbi Abraham Isaac HaCohen Kook (1986–1935), the celebrated first Chief Rabbi of pre-State Israel, is recognized as one of the most extraordinary Jewish thinkers of his time. His fame as a scholar, poet, rabbinical authority, and great leader was eclipsed by his prominence as a religious mystic. As a mystic he searched for unity in all aspects of the world and of life. He wrote many books on a wide range of subjects, always with a philosophical/kabbalistic frame of reference. He was blessed with a poet’s felicity with language and never had to rewrite anything. Rabbi Chanan Morrison studied at the Mercaz HaRav Yeshiva (started by Rav Kook in 1924) for several years and became enchanted with Rav Kook’s writings. Gold From the Land of Israel is a companion to the weekly Torah portion based on the writings of Rav Kook. Rabbi Morrison runs RavKook.n3.net, a website dedicated to presenting the Torah commentary of Rav Kook. Translating any of these writings is an arduous task. Instead, Rabbi Morrison has summarized basic ideas and presented them in a format accessible to the contemporary English language reader. This book, with several short essays on each parsha, elucidates his thoughts on many fascinating topics, including: Can we reconcile the Torah’s account of creation with modern science? What is the Torah’s view on vegetarianism? What is the purpose of death? Why do bad things happen to good people? Why do we dream? Will the Third Temple have animal sacrifices? Who is God? How can one attain joy in serving God? How should we balance our time between Torah study and work? Why must kohanim avoid cemeteries? These snippets from the vast writings of Rav Kook are indeed gold. Hopefully, the reader will be inspired to seek out the original writings contained in the helpful bibliography. 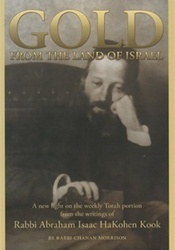 The writings of Rabbi Abraham Isaac HaKohen Kook, the first chief rabbi of Israel, are the wellspring for “Gold from the Land of Israel” by Rabbi Chanan Morrison (Urim), featuring insights on the weekly Torah portion based on the teachings of Rav Kook. The book is an important contribution in making Rav Kook’s work accessible in English. Rav Kook, who lived from 1865 to 1935, was a scholar, rabbinic authority, communal leader and poet who was deeply original in his thinking. Rabbi Morrison studied for several years at Yeshivat Mercaz HaRav, the Jerusalem yeshiva founded by Rav Kook in 1924, and taught in Harrisburg, Pa., before returning to Israel. Rabbi Morrison's book is a treasure. For those who cannot fully appreciate Rav Kook's writings in Hebrew, this volume makes his genius accessible. From a discussion of the importance of the white space in the Torah scroll to the importance of wearing tzitzits, the rav's eloquence, Torah knowledge, and love for all Jews combines for a" confluence of physical and metaphysical light.” This book is highly recommended for its philosophical discussions as well as its practical insights into the Torah readings.